Some believe that Witches say a few magic words and do a ritual and then a spell is created and performs its function. There is a metaphorical plane, a plane where all the psychic energy of both the living and the dead exists. We draw from this energy when we are being creative. It can also be psychically tapped to energize one's will and envisionment to cast spells. The metaphysical plane acts like a battery. Psychic energy is alive and can be given a will of evil or good. Good psychic energy can heal and make good things happen. The evil energy creates a negative field around the person the spell was cast on, Some evil spells can cause someone to lose health etc. It will effect random chance and make bad or negative things happen, causing luck and other factors to be reduced and depending on the nature of the spell and the psychic skill of the Witch. The spell could take years before it begins to lose its energy and effects. There are several ways to create a psychic battery. Covens are great for this. A spell cast by a coven is much more powerful then one cast by a single Witch. There are also places in the world where there are rips in the psychic energy layer of the metaphysical plane. These places are ideal for Witches because the psychic energy leaking out of the metaphysical plane is very powerful and very easy to tap. One can also tap a person and use hir as a psychic battery to cast spells, but learning to channel and draw psychic energy from the metaphysical plane is the first thing any Witch should learn. This is a good spell/ritual if you are depressed or feeling down. Sit out side in nature. Find a beautiful place. It is better that you find some place near a lake or river because water is a symbol of your feelings and emotion. Now, breath in the Air. Feel the Earth beneath you. Feel the warm sun on your face. Hear the water flow by you. Even better touch the water. Let the elements absorb your anger and fear and sadness. Let the elements give you strength to fight what ever is hurting you. 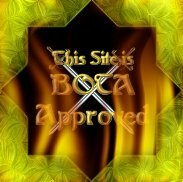 Illuminati Del Sol - This site is run by an intelligent, thoughtful woman, who has successfully put together a site that not only reflects her tastes and humor, but offers insights to many interesting subjects!